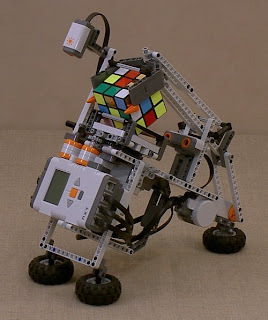 All I want for Christmas is a Lego mindstorms kit and the blueprints to this robot. The blueprints are found here: http://www.tiltedtwister.com/ so that saves you some time. – I just need the legos and a Hitechnic Color Sensor for the scanner arm modification. I have been good all year. Please reference the snippet from the feature article below, copied from the October company newsletter, for details on just how good I have been. Adele recently spoke at the Symitar Educational Conference (SEC) in San Diego, CA, attended by over 800 people from credit unions across the country. The key note speaker was legendary journalist and CBS News Anchor Dan Rather. Adele was a featured guest speaker at the conference, and the only employee of a credit union presenting this year. Adele's presentation was titled "Rewarding Your Members in Episys", a topic in which she's a recognized expert. The highlight of Adele's session was her solution for automating SACU's rewards checking program, which is now in use by over 23 credit unions. Her presentation also covered promo dividend rate solutions, custom ACS screens, referral solutions, and auto-approvals in ACS. In this year's "Creative Solutions" session at the SEC, five of Adele's custom Symitar solutions were presented and awarded. She now holds over 30 "Creative Solution" and "Unique Uses" awards given by Symitar at every SEC since 2001. In 2007 alone, Adele won an unprecedented seventeen "Unique Uses" at that year's SEC. However, Adele does not write her code solutions to win awards; she openly shares these solutions at no-cost to fellow credit unions as Chairman of the Symitar South Central Users Group (SSCUG). SSCUG is the second largest Symitar user group, comprised of IT professionals from over 80 credit unions in 7 states (New Mexico, Texas, Oklahoma, Louisiana, Arkansas, Kansas, and Missouri). All Symitar users benefit from her outstanding technical proficiency and is a prime example of the credit union industry's motto, "People Helping People". Adele’s devotion to this mantra was recognized by the credit union community in 2008, as she was the recipient of two coveted SMUG awards. These light-hearted awards are voted on by fellow credit union programmers and professionals, and presented at every SEC by Trace Security. This year, Adele won the trophies for "Most likely to share free code" and "Most participation in users groups". In addition to speaking, Adele also hosted a dodge ball tournament for the SEC and ran the Symitar Users Groups booth at the vendor expo. At the closing night of the SEC, Symitar hosted a party at the House of Blues. Adele, a vintage guitar collector and avid video game player, took the stage as part of the opening act for the band. She, and other members of the Symitar community, gave a live performance of the video game "Rock Band". Their set was followed by the headlining act, actor Jim Belushi and his band, the Sacred Hearts. After the party, Symitar thanked Adele for her continued dedication to the Symitar community with a backstage pass to meet Jim Belushi and the band. Adele's tremendous talent and dedication reflects greatly upon SACU and the credit union community. Her career path exemplifies this publication's name, "Journey of Excellence". Join us in congratulating Adele on all of her current and future successes! Thanks and I look forward to the surprise underneath my tree this year.